Today is spcaLA Day in Los Angeles! 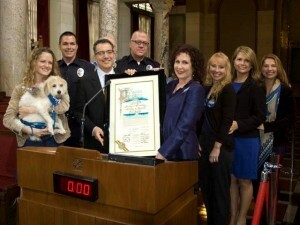 Los Angeles, CA – Today, Councilmember Bob Blumenfield led the Los Angeles City Council in declaring January 27, 2016 spcaLA Day in the City of Los Angeles as Society for the Prevention of Cruelty to Animals (spcaLA) celebrates its 139th anniversary. Founded in 1877, spcaLA is the first organization to promote animal welfare in Southern California. Originally chartered to end the abuse of horses used in travel, the organization expanded to include protection for women and children, and then pets. spcaLA has an array of programs and services, from cruelty prevention to humane education that distinguish the organization as a leader in Los Angeles. spcaLA was the first agency to enforce California’s very first law to protect animals and children from abuse (passed in 1874). spcaLA’s elite team of Humane Officers continue to protect Los Angeles’ most vulnerable residents from abuse and neglect. In 2015, they were responsible for protecting more than 12,000 animals from cruelty. Since 1994, spcaLA’s Humane Education Department has reached tens of thousands of Los Angeles’ children and teens, instilling empathy for other living things, kindness towards animals, and breaking the cycle of violence. spcaLA also operates three pet adoption centers, two pet marketplaces, a pet hotel, a grooming salon, and four training locations in Los Angeles, Burbank, Hawthorne, Long Beach, and Pico Rivera.